Physicists from the University of Paderborn have for the first time succeeded in realizing the key building blocks of quantum photonics, the full Hong-Ou-Mandel experiment showing the bunching of two single photons on a single chip. This is an important step for establishing the new quantum technology. It is needed e.g. for synchronization of quantum communications, building up quantum simulators, or quantum based high precision measurements. 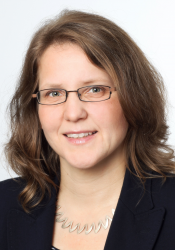 Responsible for the realization of the novel experiment is the team of the Leibniz Prize winner Prof. Dr. Christine Silberhorn, and theoretical simulation is supported by the groups of Prof. Polina R. Sharapova and Prof. Torsten Meier. The results were published on 2nd January in the scientific journal Science Advances. In modern communication networks, light-based information transfer over optical fibers is a key to achieve today’s large data volumes and fast rates. Light pulses are the information carriers. Each pulse is composed of a huge number of photons, the smallest entity of light. Using only a few photons or even single photons, however, fascinating different effects can be observed due to the quantumness of the system with perspective applications e.g. for absolute secure quantum communications or future quantum computers. If a photon hits a beam splitter, it only can decide one direction to go. When two photons meet at a crossing, they could either team-up to choose the same direction, or pass alone in different directions. However, if twin photons meet each other at the crossing simultaneously, amazingly, they will bunch together and leave the crossing at the same output. It seems like that these two quantum particles do inform each other about their route. The phenomenon with twin quantum particles differs significantly from that of classical particles. Such team-up behavior of twin photons is a basic effect in quantum optics, which is at the heart of many quantum logic operations, for example, quantum simulations, quantum repeaters, quantum computation, etc. As a milestone for the development of future quantum technologies, in the work shown by Silberhorn's group it could be demonstrated that the implementation of such a quantum optic experiment on a single chip is possible. The chip comprises a source to generate twin photons, an optical network to guide them through the structure and programmable stages for synchronizing the arrival times at the final beam splitter. This synchronization is achieved via electrical control signals enabling to adjust a time-delay between the photons. Prof. Silberhorn remarked on the impact of the present work: “The implementation of such a quantum experiment into a single chip is a major step towards miniaturization. It paves the route towards commercial applications of quantum technologies”. This research was funded by the Deutsche Forschungsgemeinschaft (DFG, German Research Foundation) – Projektnummer 231447078 – TRR 142 under Project C02 “Monolithic integration of a parametric down-conversion source and a two-photon interferometer”.